Ford is releasing two new versions of taxis. One is a hybrid Fusion and the other is a diesel Transit Connect. Ford is optimizing two of the vehicles that it is already producing. 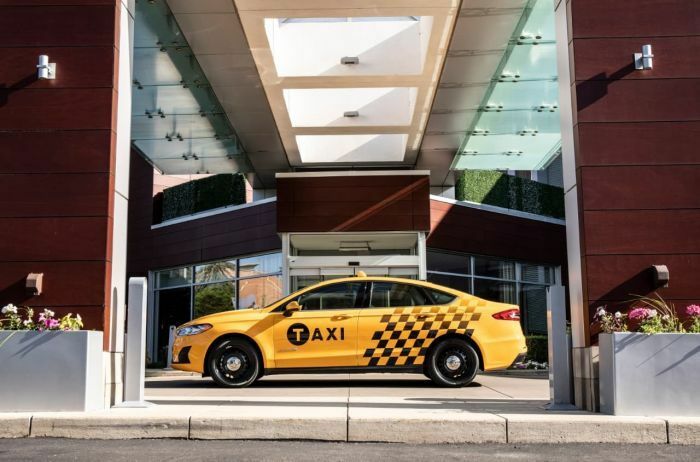 Ford is introducing two new taxis, a diesel version of its popular Transit Connect and a hybrid version of its mid-size 2019 Ford Fusion. Both options will save fuel for the companies that use them. More importantly, for Ford, the company can re-purpose two vehicles that it is already building for different markets. The all-new 2019 Ford Fusion Hybrid Taxi uses many of the same components designed for the recently announced 2019 Police Responder Hybrid Sedan. The vehicle is already designed to run nearly 24 hours-a-day and is built with a reinforced chassis and heavier suspension and wheels to withstand rigorous conditions. With the new hybrid engine, the taxi is expected to get an EPA-estimated combined rating of 38 mpg. That breaks down to projected EPA-estimated ratings of 40 mpg City/36 mpg Highway. Remember hybrids typically get better fuel mileage in the city than on the highway. The 2019 Ford Fusion Hybrid Taxi’s police-tuned suspension will allow the vehicle to sit higher. It will have calibrated high-performance brakes, plus steel wheels. It will feature heavy-duty cloth seating or optional vinyl seating, vinyl floors, available School Bus Yellow paint and a standard rearview camera. The 2019 Ford Transit Connect Taxi, when equipped with an available EcoBlue® diesel engine, is expected to get an EPA-estimated highway rating of at least 30 mpg. The final fuel ratings are not yet in. Just like other, Transit Connects, the 2019 Transit Connect Taxi offers seating for five with a roomy, flexible interior well-suited for taxi service. It features more than 60 cubic-feet cargo volume behind the second row, more than other taxis that are currently available. Along with the newly available EcoBlue diesel engine, the new 2019 Transit Connect Taxi comes with a recessed second-row seat, a taxi upfit wiring harness, first-row side curtain airbags, optional roof access hole for signage and a reverse sensing system. It is also available with School Bus Yellow paint. Standard dual sliding side doors provide riders with a wide entrance and exit. A low vehicle floor makes it easy to get in and out of. The new taxi can be made wheelchair accessible through the Ford Qualified Vehicle Modifier program. The modification features an easy-to-use ramp. Both the 2019 Transit Connect Taxi and the 2019 Fusion Hybrid Taxi can be ordered now and should be available by the end of the year. It makes sense that a company like Ford, finds ways to optimize every vehicle that it makes. It is expected to do very well selling the Hybrid Police Vehicle, if it can also use the same platform to sell fleets of taxis, it is a win-win. The same is true for its popular Transit Connect vehicle.